Don't know if you guys have seen it yet, but P Keelty has teamed up with Jackson Hogen and revamped the venerable ski gear site that gave birth to this forum long ago. It reads really well, and, with the influence of Hogen, it looks like Peter has finally come around on wider skis. That said, I'm thinking about my gear choices for the season.....I need a new hard snow/ mixed day ski and I think I am going to grab the K2 rictor 82xti....anyone try the revamped 2014 model? I've never been a paid member of the Real Skiers site for ski reviews. A post on Epic pointed out the Real Skiers site has been redone for this year and that Jackson Hogan is participating or partnering with Peter Kelty. I think if you are internet ski site savey there is a ton of information about new skis, and, in the end, you just have to get on a ski yourself. I believe I met Jackson at the Epic Tahoe gathering, he's a very entertaining gentleman. With respect to the K2 richtor 82, I have no experience. I recently had a conversation with Philpug about K2 skis and expressed my opinion that he did not seem to be a fan of that line. 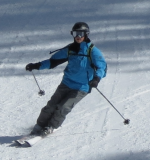 To my surprise, he was very positive about his recent demo experiences with K2 and found them to be very nice to ski. He stated that K2 wanted their nitch to be known for skis that were a pleasure to ski by the public. That says nothing about the ski you are considering. Just curious, but how did you choose that ski? Correctly or incorrectly, I think that patrollers think about their skis a little different than the skiing public, in that, a pair has to work for a patroller doing sled work, or, in all sorts of conditions, including the somewhat controlled manner the public observes when watching you and your peers. couple of reasons..1. The shop I am affiliated with moves a lot of K2's and 2. The New Rictor line (2014) had a nice buzz, and with everybody and their brother talking about the Brahma, I thought going with a brand that has lost some luster with the cool kids has some appeal. Also, I liked the reviews I read on RS. And I skied the rictor last year (and the impact) and thought they were great no-nonense skis. My other plan is to get the Ski Logik Occams Razor, again, I have skied them, they are great (for what they are) and they're not the sort of ski people salivate over anymore. The razor with the Shaman (in similar lengths) how's that for a focused east coast quiver? Just some musing as the nights get colder. A common malady for we skiers this time of year. My Head Rev 85's will spend this winter in the Pacific northwest, so a hole exists in my quiver...again. How sad....separated from a beloved pair of skis. What's up with that? Did you sell them? Loaned to a friend? Stored at a friend's, awaiting your return? My Rev 85's went from Big Sky to Tahoe so that Philpug could remount the bindings I had purchased/installed at BS. They were mounted to far back and it really impacted the way the Rev's skied. I liked the Rev's, with the caveat that they were just too close to my Hart Pulse skis. High Angles had cautioned me about this when I did my purchase. Phil sold them in his ski shop Labor Day Sale for pretty much what I paid for skis/bindings, so, I have a credit at Start Haus. The buyer is an Epic member from Oregon. Phil and I will work something out, maybe The Ski that I demo'd for a day in Big Sky. Good Carver, soft tips for bumps. I did read the Real Skiers reviews for you proposed K2 purchase and they were very positive. The reviews of the K2 line were very much in line with Phil's thinking they want to make skis that the public will enjoy skiing. I'll have to demo some K2's this season. Makes sense. If I recall, the Pulse are 77mm? I have read good things about The Ski. And Scott certainly makes great products. The good thing is, there are plenty of great skis in the 90mm range to choose from. You should have fun demoing this winter. Kastle FX84 and the FX94.....sweet rides that have it all! Mike...you should demo the Rev 105...the ski is a blast! I looked at a Rev 105, mostly because of the buzz the intrawebs give it...but my last two head skis and I didn't quite mesh. I loved my old monster 88's, I got the head Peak 88 Flowride to replace it, which sucked, and I skied the Head RnR 180cm all last season...which I liked in some conditions, but not where I typically ski..at least not where I would typically ski a fatter ski. It's well made, has a nice flex and all that, it just wasn't right for my skiing so i am done with wider head skis for a bit. I did end up getting the 2014 Ski Logik Occam's Razor (162cm, 11.5m turn) and the 2013 Icelantic Shaman 161cm. Honestly, these are a pretty stellar east coast quiver (though the shaman win't for everyone, I love it). I also still have a Skilogik Howitzer 186cm from last season...which is a fine ski and great in open crud and deeper snow. Not bad in soft snow glades either (but the Shaman is better). I am selling my 2013 Head RnR (if anyone here is interested-$250.0O flat and 350.00 with the Rossi Axial2 140 XXL bindings that are on it). And my trusty pair of Dynastar Contact 4x4's 172cm with PX 14 bindings (125.00). Solid skis both-but paying the piper requires some choices. Nice selection of skis Liam.. The Rev 105 is truly a different ski..probably not for everyone. I did drop down to the 171 length giving my son my 181..he's 4 inches taller and 70 lbs heavier. The Rev 105 turns, floats, and bumps amazingly well and even on western groomers...the freakn' thing rips...blew me away. In all ...there are so so many fine skis out there....the trick is...the right fit! It might be helpful for those looking for new skis to make a list of the features that are the highpoints of their ideal target ski. Some form of this could be helpful in one self evaluating what they really are seeking. The Realskiers site (www.realskiers.com) is completely open for a while. No login is required. I assume that the reasoning is to allow people to see for themelves what a subscription buys you. One thing that does appear to be new is a series of regular articles by Jackson Hogen, who appears to be teaming with Peter on site contents. Realskiers will revert to a subscription only site at some point, so check it out while you can.